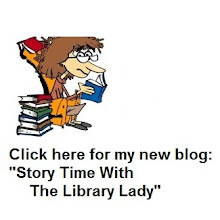 The Library Lady Rants: So What's New? We moved at the end of August, a hellish move that took 12 hours because of the Man's crap. Nearly 100 boxes of books now reside in a basement area that was SUPPOSED to be JR's music spot. Instead she plays the guitar next door to my room, and the sound carries all over the house. More boxes are still marring the living room, and a bit of the family room, but the Man is finally working on shoring up some bookcases, so we should have the living room cleared at least. This has been delayed because he has wasted innumerable hours over curtains--needed, but he's complicated this as he complicated everything. I am grateful that he agreed we needed a contractor to handle lighting and other things in the house before we moved in--or I'd have been waiting years for that. JR had a very hard time adjusting to the new house, but she has done it, and now has mastered taking the city bus home after school. SC of course, has managed things beautifully, aside from the fact that she is trying to pass the PRAXIS exam for teaching, has failed the math twice, and is costing us too much money in tutoring. Her boyfriend was a huge help in moving things from our $500 a month storage unit to the new house in a sweltering August heat wave, and is always happy to come over and help put together new furniture and such. I like him, I just worry about him and SC for the long term. Bruce the Bold discovered he could break out of most of our rooms closed doors, including the linen closet, and we have had to manage that. He took to the new house easily. Molly was terrified of course, hid behind the dryer in the laundry area for most of the first day or two, and even slept with me at night a bit--something she never does. But she got used to the house, especially since I set up our bedroom window areas to be similar to her sleeping places at the old house. We have spent a fortune fixing up the old place. It has now been on the market for 3 weeks and nary a nibble. Apparently we needed not only to put in new stainless steel appliances, but new kitchen cabinets and GRANITE countertops to get a good price. I am getting scared, because we will soon run out of reserve funds, and if we don't sell soon it will be a very hard winter. And the Man SHOULD be happy, and perhaps he is, but he is generally not talking to me, and I can't write any more about this today. I just can't.